Breathtaking. Beautiful. Shocking. Revolutionary. All of these words, in one language or another, were likely uttered by automotive pundits visiting Lamborghini's display during the 1966 Geneva auto show, where the marque revealed its finished Miura to the world. The car's sleek, muscular lines and mid-mounted engine placement were unlike anything seen before on a road car and borrowed heavily from the motorsports world. Today, we know the Miura as the world's first supercar, setting the scene for the contemporary hypercars with performance far exceeding what was once thought possible. Back in 1965, though, young Americans were protesting the Vietnam War, as many working-class Italians protested what they deemed unfair labor practices in Italy's booming industrial plants. Strikes were commonplace, but despite the odds, self-made tractor manufacturer Ferruccio Lamborghini had founded a new luxury automaker. Automobili Lamborghini was barely more than a year old but already thriving. Orders came quickly for its 350 GT, a fast, luxurious sports coupe meant to offer buyers of Ferraris and Maseratis a higher-quality, more user-friendly car. Powered by a front-mounted 3.5-liter quad-cam V-12 engine developed by Giotto Bizzarrini—the mastermind behind Ferrari's all-conquering 250 GTO sports racer—the 350 GT and the succeeding 4.0-liter 400 GT were successful nearly straight away as fast, attractive grand touring cars, but they did fairly little to move the bar. For its second act, Lamborghini would build a car to shatter the status quo. In the top tiers of motorsports, front-engine cars had already had their day. By now, Formula 1 race cars had their engines mounted just behind their drivers, and a quick look at the starting grid of the 1965 24 Hours of Le Mans reveals more of the same: mid-engine Ford GT40s, Ferrari 330 P2s and 250/275 LMs, and Porsche 904s. Despite the mid-engine configuration's obvious dominance, industry chiefs—Enzo Ferrari most notable among them—were dubious that their well-heeled customers had the skills needed to keep such a car safely on the road. Lamborghini and his young development team had no such reservation. In fact, aeronautical engineering graduate Gian Paolo Dallara, then just 26 but already having served stints at both Ferrari and Maserati, insisted to his boss that a mid-engine road car was the way forward. Amplified by young engineer Paolo Stanzani, 27, and New Zealand-born race mechanic turned. development driver Bob Wallace, also just 27, youthful confidence and vigor were in strong supply at Lamborghini's Sant'Agata Bolognese headquarters, just down the street from Ferrari's Modena workshop. 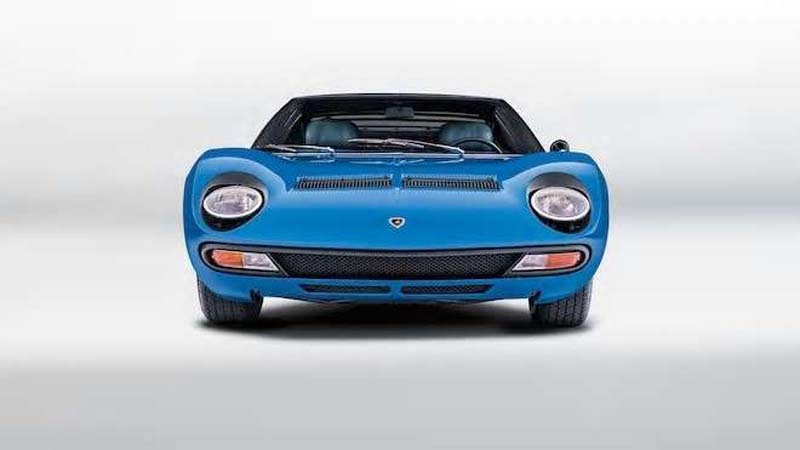 Ferruccio Lamborghini's sights were not set on racing, but he anticipated the credibility such a road car would bring to his startup automaker and happily signed off on the Miura's development. The 350-hp, oversquare, 60-degree 4.0-liter Bizzarrini V-12 from the 400 GT would serve duty in the Miura, but Dallara determined it should be mounted transversely, not longitudinally as it was in the grand tourer. Not only did a transverse-mounted engine consolidate weight closer to the car's midpoint, but it would also allow room for a token 5-cubic-foot trunk behind it. The team fabricated a welded steel chassis, drilled for lightness where feasible, with a central tunnel acting as a supporting backbone to which the front and rear bulkheads and floor pans attached. 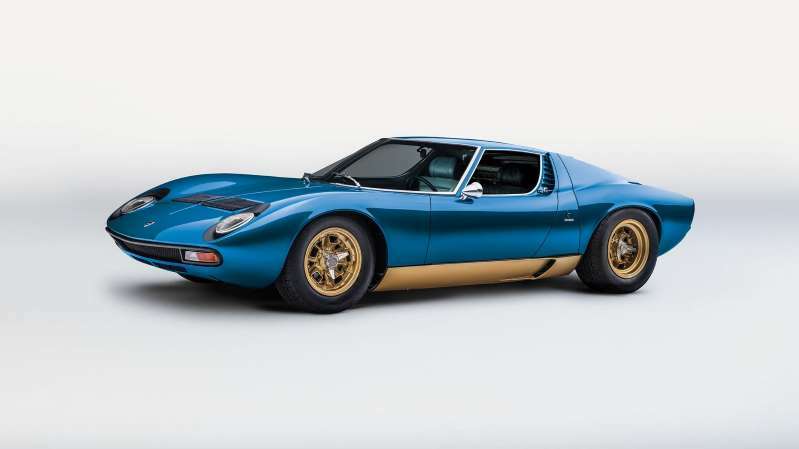 Italian design firm Bertone, which favorably had no formal ties with Ferrari or Maserati, took over the Miura's design process with 25-year-old Marcello Gandini leading the charge, another youthful arrow in the car's quiver of developers. Throughout late 1965 and early 1966, the Miura slowly transformed from a figment of imagination to a running, driving car unlike any the world had seen. Low-slung and swoopy, the Miura's large windshield swept back dramatically, and its roofline trailed down over the mid-mounted V-12 toward the car's wide hips. Although prototypes had a plexiglass screen covering the engine, ventilation and visibility issues led Gandini to design a stylish set of louvers to keep rainwater out while preserving rearward visibility. Air intakes bulged from the rocker panels to keep the rear brakes cool and from behind the doors to feed fresh air to the engine's four Weber carburetors. The Miura's front hood and rear engine cover were made from aluminum (the doors, roof, and A-pillars were steel), and they opened clamshell-style for greater access to what lay within. The Fiat 850 Spider-derived headlights were perhaps the only awkward exterior feature, with their metal "eyelashes" and incohesive appearance when lifted into operational mode. The cabin, too, was a sight to behold, with twin pods directly in front of the driver housing a large Jaeger speedometer on the left and tachometer on the right, while secondary gauges and switchgear were stashed in the hooded center stack that jutted from the middle of the dashboard. A five-speed shifter sprouted from naked chrome gates on the center console, which also lent space for the ignition switch and a comically large passenger grab handle. Switches that didn't find homes here were reassigned to a ceiling-mounted pod behind the rearview mirror. 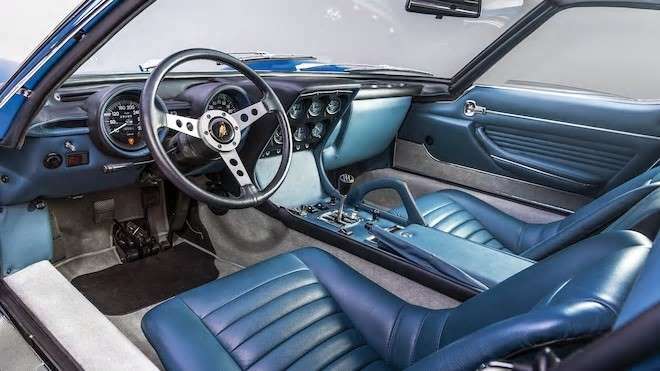 A large, three-spoke, leather-covered steering wheel blocked much of the two instruments behind and sat squarely between most drivers' knees, but it certainly looked the part. Following the Miura's debut, Wallace drove it to the F1 Monaco Grand Prix to run demonstration laps around the circuit. Ferruccio Lamborghini himself stirred up a crowd by revving the car's V-12 loudly in front of the affluent locale's famous Place du Casino. At the Paris auto show later in 1966, Wallace gave prospective buyers thrill rides around the show's host city. Finally, in 1967, production began, and Lamborghini sold an impressive 108 examples by the end of that year. But Miura development didn't stop, with Dallara, Stanzani, and Wallace all improving the car even as orders continued to roll in. An S version arrived in late 1968 with better-quality cabin trimmings, a revised rear suspension, uprated Pirellis, and 20 more horsepower for 370 total. In 1971, the SV made its debut. 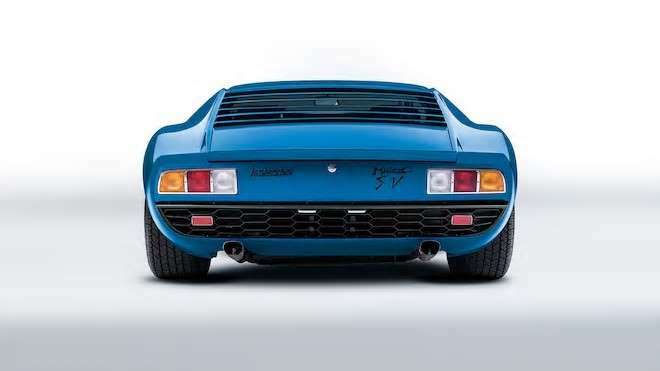 Planned to be a special-order, higher-performing Miura, demand was strong enough that it instead entered regular production. Changes included flared rear fenders to fit wider 15-inch low-profile 60-series tires. Revised taillights and a refreshed nose with an integrated bumper, a mesh grille, and side markers were all new. 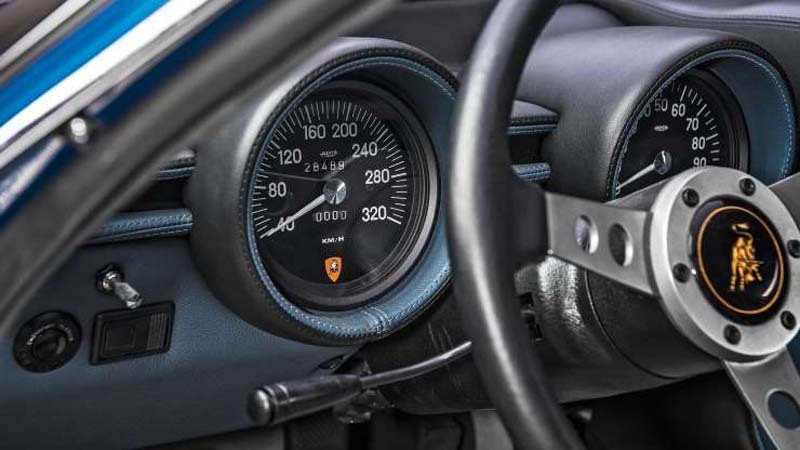 The Miura lost its peculiar headlight eyelashes, and a glove box was added to the passenger-side dashboard. Power increased to 385 hp at 7,850 rpm courtesy of new cam timing, larger intake valves, and rejetted carburetors. Chassis reinforcements were perhaps the most significant improvements, and combined with a wider rear track made handling at the limit less treacherous. By now, the sprint to 60 mph took just 5.8 seconds, and top speed was said to be 180 mph. Yet the Miura's end was nigh; in 1971, Lamborghini also showed the Gandini-designed, wedge-shaped Countach concept for the first time. By 1973 the Miura's production run came to an end, and the Countach picked up the torch for Lamborghini. But thanks to the Miura, the supercar era was in full swing with new mid-engine competitors arriving from Ferrari and Maserati, and the automotive landscape was never again the same. Likewise, neither was anyone who's so much as drooled over a Miura in the sheetmetal.